We like something a bit different here at Moshville Towers, so a recent email from Steve McDonald caught my eye. Rather than being another request for an EP review or an interview or tour dates in Alaska that it’s unlikely we could attend, Steve is launching a month-long rock/metal art exhibition of sorts at Bannerman’s Bar in Edinburgh. 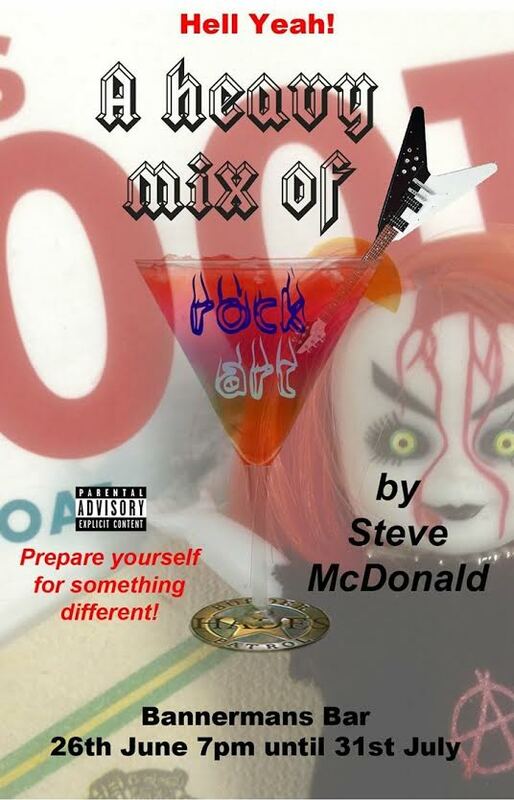 Kicking off on June 26th and running through to July 31st, “Rock Art” features a mix of Steve’s gig photos of local acts (including Metaltech and Nest of Vipers) as well as more established bands like Beasto Blanco, Psydoll and Hanzel und Gretyl. The work features 3D elements, blood, LED lights, naughtiness and silliness. It truly is something different and a first for the bar. Bannerman’s should be applauded for giving Steve the chance to present his work like this. For those who don’t know Bannerman’s, it’s a couple of minutes walk from the bottom of the Royal Mile in Edinburgh so it’s really central. They also do some bloody good beers and host great bands. Our own Gary Cooper is a regular there as a gig photographer and he loves it, as does Damy of Pulvis Et Umbra who I dragged along there when I met him the other week. Moshville Times wishes Steve all the best with the exhibition, and I’m sure at least a couple of us will be popping in to see it over the time it’s on. Any excuse for a beer and some metal!